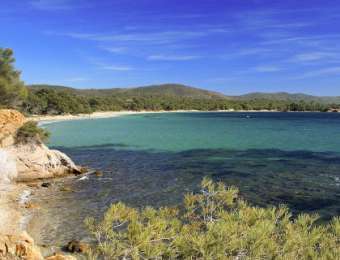 Located very close to “Camping de La Pascalinette”, this beach is part of Domaine de Léoubes in Bormes-les-Mimosas and adjacent to La Londe-les-Maures and Plage de l’Argentière. Plage du Pellegrin is an 870 metre-long sand and pebble beach. This vast and unspoiled creek offers a gentle slope and is lined with pines providing welcome shade. The car park is paying (parking obligatory) and situated inside Domaine de Léoubes (follow signs to “Cabasson Brégançon” then “Plage du Pellegrin”). You can also reach it on foot via the coastal footpath from Plage de l’Argentière. Plage du Pellegrin is very well-sheltered from all prevailing winds!